Dutch designer Piet Boon's first major multi-residential project in the US arrives at 404 Park Avenue South, and Dwell has an exclusive sneak peek. 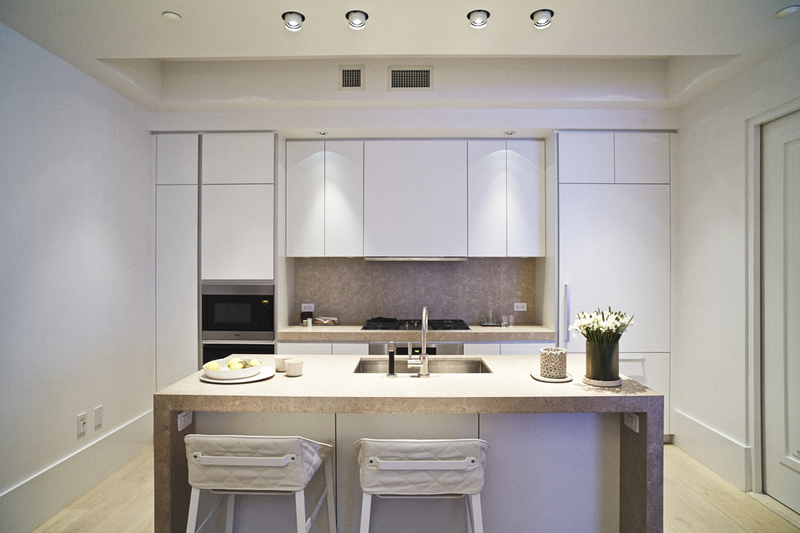 The kitchen of model unit 6C at Huys, 404 Park Avenue South, designed by Piet Boon with Karin Meyn. The kitchen sports white lacquer cabinetry by Bulthaup with a Chambolle marble countertop, Dornbracht fixtures, and Miele appliances. Flooring is 8” wide oak plank floors from Piet Boon flooring by Solidfloor. The Huys apartments come with electronically controlled solar shades with concealed window shade pockets and recessed lighting fixtures by Flos. Shown here, the living room of a two-bedroom unit. Piet Boon designed the leather banquette shown here specifically for his Huys project. For more on Boon's furniture design, visit the first-floor gallery at 404 Park Avenue South. The ceilings are 11'5" tall and feature original beams that have been painted over in a cool white. Each bathroom in Huys is decked out in Chambolle stone slab, from flooring to countertop to wall tiles. Piet Boon-designed lighting illuminates a Duravit sink, Dornbracht fixtures in matte platinum, and a Kaldewei soaking tub. The floors are equipped with radiant heating by NuHeat. The 58-unit building features custom millwork details, including built-in window seats, dining banquettes, and Piet Boon signature applied closet doors and frames. The Dutch are back in Manhattan. It's been a few centuries since the boom of New Amsterdam, but thanks to Piet Boon and a team of designer compatriots from The Netherlands, New York City apartment hunters will have the chance to buy into the rigorous-yet-whimsical aesthetic. Huys is located at 404 Park Avenue South and is set to open in May 2014. Boon, who collaborates with Karin Meyn at Piet Boon Studios, developed the interior architecture, room layouts, fixtures, and finishes for the 58-apartment building, as well as the styling of a two-bedroom model unit in 6C. Joining him are Dutch landscape designer Piet Oudolf, Dutch property developers Kroonenberg Groep, and Sciame, the New York-based construction company. Click through our slideshow for a sneak peek at the interiors of Huys and a taste of Boon's craftsmanship, attention to detail, and use of natural light.